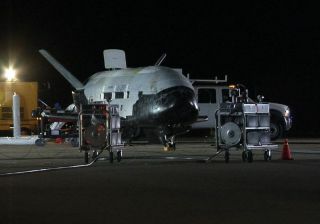 KENNEDY SPACE CENTER, Fla. – Two months after a sister ship successfully concluded a demo flight, the U.S. military's second robotic X-37B space plane is in Florida preparing for blastoff March 4 on another secret mission, according to an Air Force official. The 29-foot-long, 14-foot-wide X-37B space plane is being readied for flight in a processing facility near its launch site at Cape Canaveral, Fla., according to Lt. Col. Troy Giese, the X-37B program manager in the Air Force Rapid Capabilities Office. The United Launch Alliance Atlas 5 rocket is being readied for launch at Cape Canaveral's Complex 41. Both stages of the booster have been assembled inside a vertical integration building, and the rocket is scheduled to roll out to the pad later this week for a pre-launch practice countdown and tanking test. The wet dress rehearsal is on tap for Friday, according to an Air Force spokesperson. Giese said he anticipates a third X-37 flight sometime in the future, but the Air Force has not decided when it would launch. The X-37 craft that just returned to Earth in December would be assigned to fly a third OTV mission, according to Giese.